On January 1, 1915, Andrew H. Osborne, Sr. left the Boyd N. Park furniture store and undertaking establishment in Franklin, to take up the same line of business in Greenville, as the successor to J.W. Baird. Thus, Osborne Funeral Home was born in Greenville on 11 North Mercer Street. During this time, the average cost of a complete funeral was $85, and usually carried out in the family home. Following the pandemic flu outbreak of 1918, Mr. Osborne moved the business to a red brick building at 6 Penn Ave., where he’d operate for the next 25 years. This new home was originally constructed by James Sheakley, who served as a US Congressman and Governor of Alaska, before moving back to Greenville and serving as Mayor. In 1944, Mr. Osborne moved the business to its current location at 73 Columbia Ave. This home, constructed by S.D. Downs, was built in 1906 and was described as one of the most attractive homes in Greenville at the time. The property was complete with a small pond, used for swimming, fishing, and ice skating. Andrew H. Osborne, Jr. purchased the business from his father around 1948, and operated as “Andrew Harper Osborne, Jr. Funeral Home and Convalescent Rental Services”. During this era, it was very common for the funeral home hearse to also double as the local ambulance service. Andy, Jr. also served two terms as the Greenville Mayor, which was during the borough’s 125th anniversary celebration. 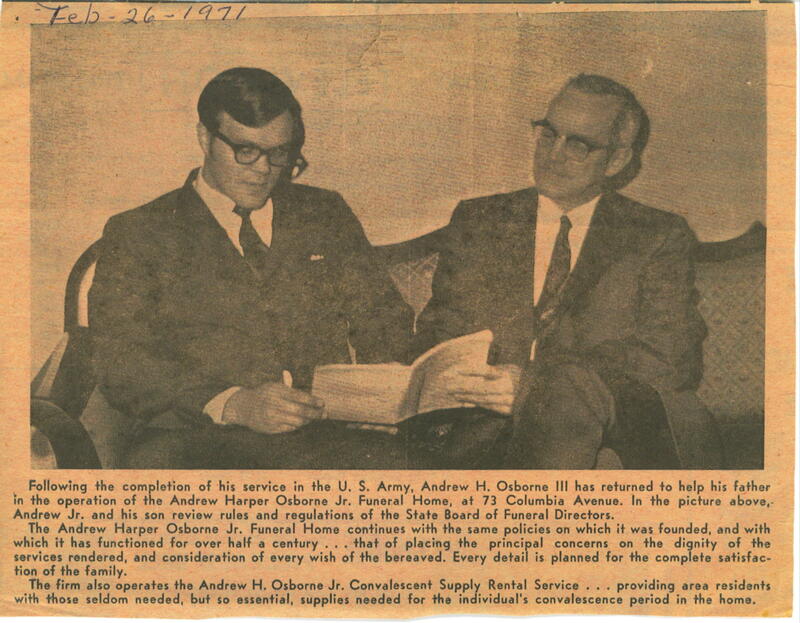 After completing his service in the Vietnam War with the US Army, Andrew H. Osborne, III purchased the business from his father in 1973 and operated as “Andrew H. Osborne, III Funeral Home, Inc.”. In 1998 Andy passed away unexpectedly, at the age of 51, from surgery complications. His wife, Theresa, was left to run the business, and she hired local funeral director, John Rodgers, to assist with the transition. Prior to Andy’s death, he hired his step son to learn the family business in preparation for his eventual retirement. Stephen A. Williams, a Greenville High School and Clarion University graduate, only worked for his step father a short period of time before Andy’s untimely passing, which forced him to enroll in the Pittsburgh Institute of Mortuary Science a little quicker than originally planned. The Williams family is very community minded, as Steve has served as past president of the Greenville Area Chamber of Commerce, Greenville Rotary, and has volunteered on several other committees in Greenville. Christina is very involved and serves on the Greenville Little League board. They have two sons, Stevie and Sawyer, and they are members of Zions Reformed United Church of Christ in Greenville. To date, the funeral home has handled more funerals than there are people living in the borough of Greenville (according to the last census). It is an honor and privilege for us to continue the traditions that the Osborne name has afforded this community for the last 100 years.